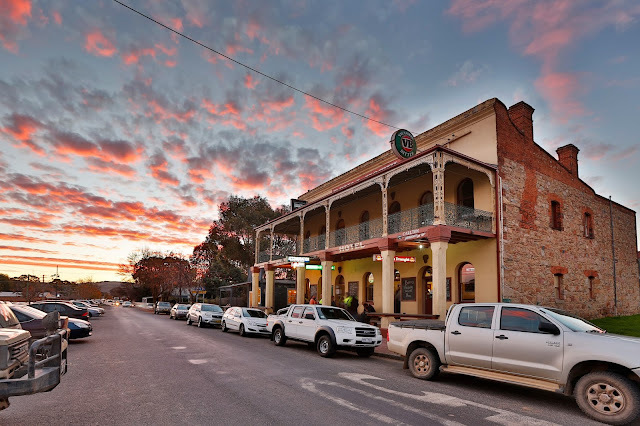 The Royal Hotel Bungendore which once housed the best (and only) Chinese in town. At least once a week, every week for the last five years myself and my husband have wandered through our back gate, into the local pub and had a meal at our local Chinese restaurant. If I am totally honest it was quite often twice a week and I am pretty sure there was at least one occasion we ate there 3 times in one week. It was by no stretch of the imagination award winning food but it was Australian country town Chinese that is a brand all of it's own. They had all the classics, Kung Pao Chicken, Mongolian Lamb, BBQ Pork and Plum Sauce, Honey Prawns, Combination Chow Mein. It was the standard menu you would expect from such a restaurant but they did it well and for the right price backed with good service. And lets's be honest it was located at the end of our yard so there was the convenience factor. We aren't spoilt for choice out here in the country, options generally range from Chicken Schnitzel, to Hamburgers to an egg and bacon roll and we were lucky to have the only Asian food in town right at our back door. I talk in past tense as the restaurant recently closed leaving me with an empty hole in my stomach that craves my weekly Chinese fix. Just two weeks on from it's closure and I am still in mourning. To cheer myself up I decided to pull out my favourite Chinese cookbooks and whip up some Chinese flavours to fill that hole. If you are looking for great Chinese cookbooks there are two chefs you cannot go past. Neil Perry and Kylie Kwong. I have reviewed Kylie Kwong's cookbook on the blog before and since then I have also been cooking from Neil Perry's Spice Temple. Together these two books have your Chinese cooking needs covered and they are a testament to how fantastic Australian published cookbooks are. I was surprised when I found out that Neil Perry was a renowned Chinese chef. His daggy blond pony tail belies a secret passion for Chinese cooking especially leaning towards the punch of Szechuan cuisine. I personally can't go past a hot and numbing szechuan dish and I have harped on about it quite a bit here on the blog. Those peppercorns get me every time. Spice Temple is one of the few books that have made me desperately want to go to the restaurant it represents. which is quite a feat as I find most restaurant cookbooks too "cheffy". They write them for themselves and their cheffy friends forgetting that the home cook isn't cooking for 100 people or has 5 days to prep a multitude of elements. This book succeeds in that it is an ambassador for the restaurant as well as being practical for home cooks. I went through both books from front to back twice before I finally settled on a Red Braised Pork Belly from Kylie and a Prawn Wonton with Spicy Szechuan sauce from Neil. I was yet to make wonton wrappers from scratch and having been itching to do so for some time and the pork dish would give me a chance to pull out the master stock I have been developing for a few years now. I also recently purchased some of the meatiest pork belly I have ever seen and have had it portioned up in the freezer waiting the perfect dish...that dish had now arrived. Kylie never fails to impress with her braised meat dishes. The pork simmered away for three hours absorbing all of the flavours of that master stock and the final dish was so tender it just melted in your mouth. Neils wontons also hit the mark and the spicy sauce reminded me of a favourite dish of mine from Din Tai Fung, a well known Taiwanese dumpling restaurant that has branched out to Australia. The homemade wonton skins were silky and had the texture much like home made pasta. Far superior than the ready made variety. Both dishes had a great depth of flavour, layers of all the tastes that make Chinese food so great garlic, chilli, soy, chinkiang vinegar, ginger all balanced so they pop on the palate. The dishes certainly bought authentic tastes from China but they just didn't fill the hole quite as I expected. 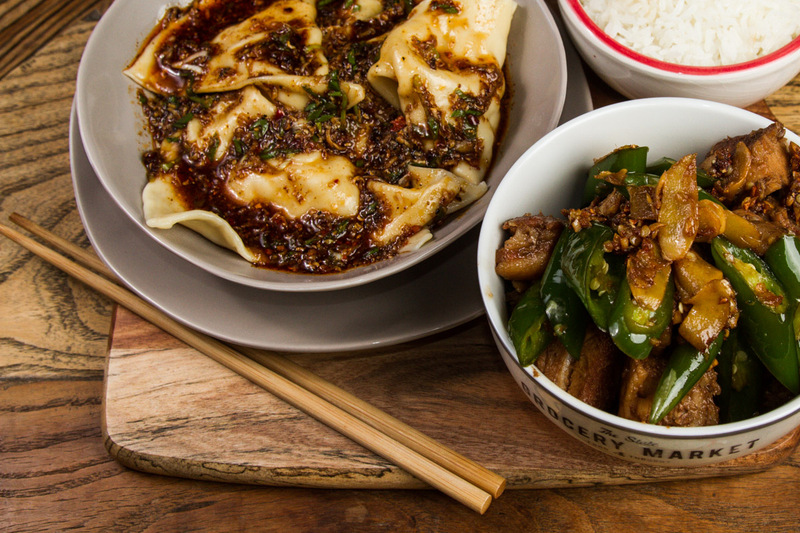 Australian-ised Chinese is almost a cuisine of it's own. It's not particularly authentic, it's not particularly refined but it is familiar and safe and full of memories of growing up in rural Australia. Who knows what the future holds though, there is a gap in the market in Bungendore if any Golden Dragons, Lotus's, Camellia's or Golden Stars need a new home....please. Kylie Kwong and Neil Perry dishes together at the table. I should have made one more dish from Ken Hom maybe and then I could have named it the Holy Trinity. Missed Opportunity!